EDINBURG — Eloy Heraclio Alcala has been waiting more than four years for his day in court, a second chance for a jury to decide whether he is guilty of the two capital murder charges he has faced for nearly 8 years. The 13th District Court of Appeals awarded Alcala, 51, a new trial in July 2014, a trial that begins Wednesday after years of being rescheduled. A jury convicted Alcala of two capital murder charges in April 2012 for the shooting deaths of David Garcia and Victor de la Cruz, who Pharr police discovered with fatal gunshots to the head at approximately 1:30 a.m. Oct. 8, 2010 in Pharr’s Las Milpas neighborhood. There were no witnesses to the murder, but according to testimony during Tuesday’s suppression hearing, neighbors — who declined to give their identity to police — pointed officers in the direction of Alcala’s residence, telling them they saw a white Dodge Ram leave the scene. One of the victim’s family members also told police her son had been involved in a physical altercation with Alcala’s son, Eloy Jiovanni Perez Alcala, a few hours before. A truck matching the description of the suspect vehicle was located at Alcala’s residence, which was just four blocks from the bodies, in addition to a Cadillac with blood on its front seats. The younger Alcala, 29, was convicted of capital murder in December 2011 and is currently serving a life sentence in state prison. The 13th Court of Appeals denied his appeal in November 2013. Visiting Judge Romeo Flores, who was appointed to preside over the new trial in lieu of District Court Judge Mario E. Ramirez Jr. for unspecified reasons, denied Alcala’s motion to suppress evidence collected at the house and inside the vehicles, which included weapons and ammunition, clothing and blood samples. Alcala’s attorneys Daniel Reyes and Jaime Alemán argued that Pharr police illegally obtained the evidence because they entered Alcala’s property without a search warrant and trespassed on his property. The judge, however, sided with the prosecution’s argument that the officers’ actions were justified by the exigent circumstances and the seriousness of the alleged offense. 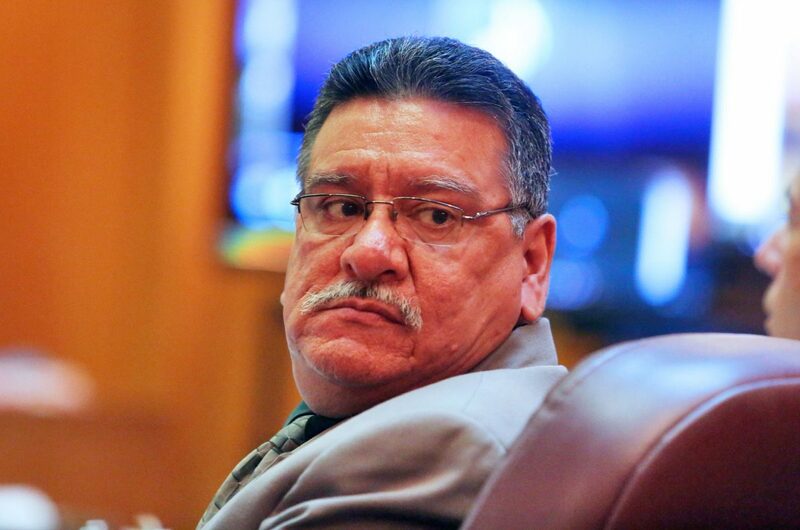 Flores also denied Alcala’s motion to prevent the assistant district attorneys trying the case from using inconsistent theories to secure convictions in both of the Alcala’s cases. Reyes argued the state, to secure a conviction, had depicted the older Alcala as being the shooter during his son’s trial, while framing the son as the shooter during Alcala’s trial — in both cases using the Texas Law of Parties, which holds that those involved in a crime resulting in death are equally responsible even if they weren’t the actual killer. In awarding Alcala a new trial, the appellate court ruled that Ramirez — who presided over the first trial — had erred in allowing Alcala’s interrogation video to be shown to the jury as evidence. The new jury, which was selected Tuesday, will hear opening statements Wednesday morning.